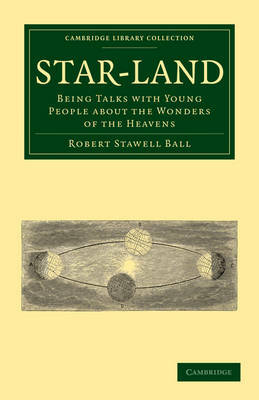 Sir Robert Stawell Ball's Star-Land of 1889 is based on some of his Christmas Lectures at the Royal Institution during his time as royal astronomer of Ireland, a post he held from 1874 to 1892. These lectures were aimed at a young audience in order to introduce them to the subject, and fire their interest in the wonders of the universe. This volume includes lectures on the sun, the moon, the inner and giant planets, comets and shooting stars, and stars. It also contains a chapter on the observation and naming of stars. Ball was a renowned public lecturer, with commissions across Britain, Ireland and the United States, where his anecdotal and conversational style won him much popularity. The author of several frequently reprinted science books, he was knighted in 1886 and in 1892 became Lowendean professor of astronomy at Cambridge and the director of the university observatory.